It’s first period and I’m teaching high schoolers. The end of class is near and I’m starting to worry if each small group is going to get a chance to present what they’ve been working on. There’s a commotion in the hallway. An entire class of middle schoolers, many of whom I teach on a different day, are waiting along with their teacher to get into my classroom. I peek out and ask what’s going on. I’m told that they need to use my large room just for a moment to make a brief announcement. What!? Are you serious!? No one told me. I didn’t plan for this. How will I wrap up the class with 10 minutes less than should have? Aaaaaagh! This is what I’m thinking in my head, and I’m afraid some of it shows as I mutter, “OK then. C’mon in,” and usher everyone in in a sarcastic flourish. 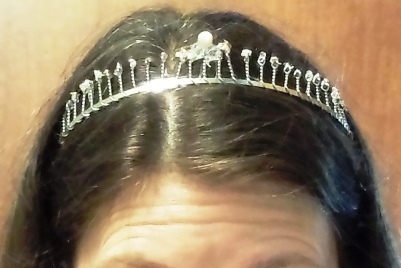 One student hands me a tiara. A small speech is made by my fellow teacher, formerly known as Interrupter. Students form a line to one-by-one press their small notes of thanks into my palm. A young lady is chosen to read a poem that extolls my traits. Huffiness was not among those listed. I manage not to cry, and we all get a good laugh at how poorly I hid my irritation. Once class was over I was able to read through the notes and savor the poem. 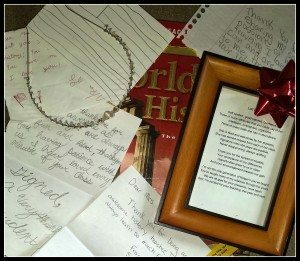 I was deeply touched by the kindness of my students and colleagues. Soon, my school day was done and I ran an errand at the grocery store. 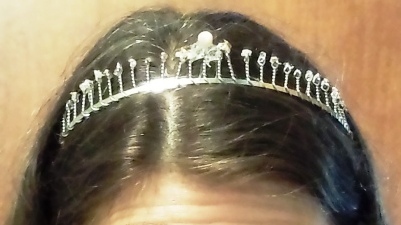 It wasn’t until I got home that I realized I was still wearing my tiara. I wore that SO much better than huffiness.